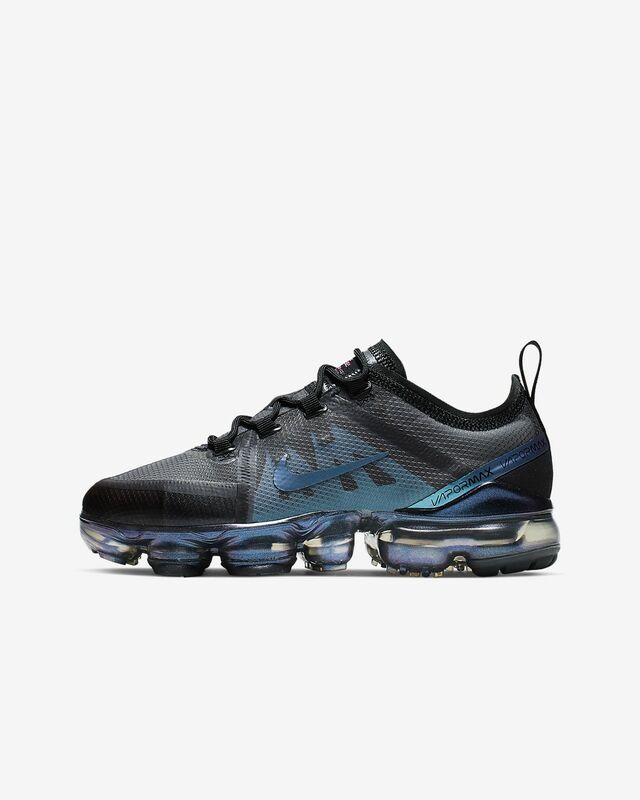 The Nike Air VaporMax 2019 is covered in a translucent layer that shows you the inner layers of the shoe. VaporMax Air cushioning is also translucent to let you see the air you're standing on. This shoe is lightweight and flexible with a super-bouncy sensation. 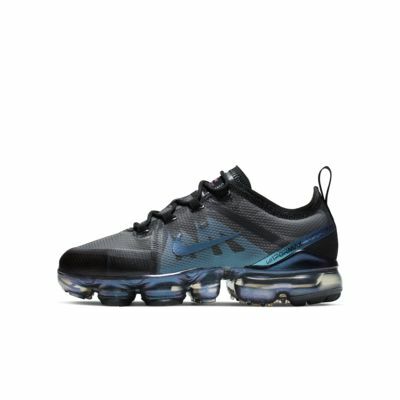 The Nike Air VaporMax 2019 is covered in a translucent layer that shows you the inner layers of the shoe. VaporMax Air cushioning is also translucent to let you see the air you&apos;re standing on. This shoe is lightweight and flexible with a super-bouncy sensation. Fabric is lightweight and flexible. Translucent overlays create durability and let you see the skeleton of the shoe. VaporMax Air cushioning feels lightweight, bouncy and flexible. Rubber on the bottom is durable. The Air VaporMax represents a new era in Nike innovation. "It&apos;s changed our whole philosophy on how we design for Air", says Cushioning Innovation Designer Zachary Elder. The designers started by restructuring the Air unit so they could attach it directly to the upper. "That was the biggest challenge", says Tom Minami, Senior Footwear Designer—but it was worth it. "Without any midsole or sockliner, you get to feel the Air in a whole new way". In previous Air Max models, the goal was to fill the sole with as much Air as possible, but with the VaporMax, the focus is on using the Air efficiently. "As you step down, each lug gets pushed into the Air unit, ramping up the pressure", Elder explains. "As you step off, the pressure releases, creating that springy bounce". After the seven-year journey from ideation to release, Elder and Minami are excited for what&apos;s to come. "I&apos;m super proud of the product", Elder says. "This new approach is going to be a huge turning point for Air—and for Nike". They are very comfortable in your feet! Do not like them at all . My heels are narrow and these buckle and are not tight enough to keep my heels from slipping in the shoe . Do not find them very comfortable for walking all day at work. Front of the shoe is flimsy with not a lot of support Nothing like my air max plus shoes which are the best shoes I have ever bought or worn Will be returning these.